Luxury holiday accommodation in a self catering thatched 3 bedroom chalet, each with air-conditioning and a roof mounted fan. There are 3 Bathrooms, a large open plan living area with fully equipped kitchen. 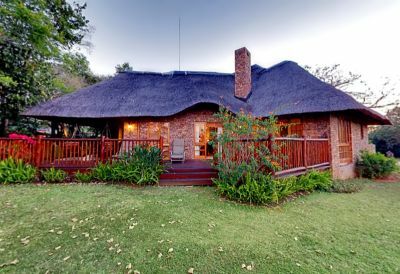 A large deck overlooking the 8th fairway and an outside built-in braai-area under thatch roof overlooking a lush garden will allow you to enjoy a relaxing sun downer on the patio while watching Impala grazing. <<Full accommodation details and pictures here.